"PUBLIC SPEAKING EBOOK": "Say it! With Confidence, without fear or shyness!" 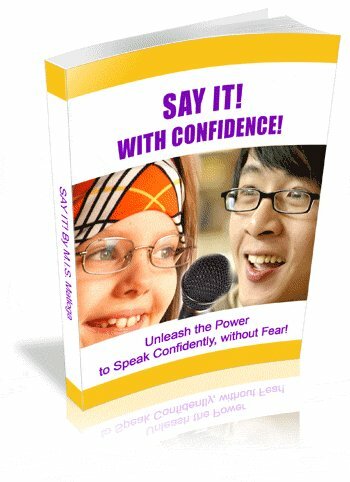 PUBLIC SPEAKING EBOOK: "Say It! With Confidence!" How to say it with confidence when you are too shy to say boo to a goose! What I am saying is that, you are definitely not alone! Millions of people worldwide suffer from social phobia or shyness. The good news is that these socio-emotional states are perfectly manageable. The sad news is that, most people are unaware of these good news and will still try and live with the worst of these emotions. Yes, you may be feeling that "shyness or social phobia" are somehow a part of your genetic imprint but I will tell you now: Despair Not, because they can be managed and controlled, with the right tools, knowledge and information. This e-book will, through inspirational stories, guidelines, tips, and techniques, show you exactly how to deal with shyness, paralyzing fear,low confidence etc. and how to use your nerves to your advantage and express yourself with passion and confidence! The ebook will boost your confidence, give you strategies for coping and help you manage your shyness whether you are speaking to a room full of people, a stranger on the street or just your own children. Yes as parents you need to be able to motivate your children, encourage them and build their self esteem. BUT FIRST, DO YOU NEED AN EBOOK LIKE THIS ONE? CHECK AND DECIDE FOR YOURSELF.
. Are you shy, suffer from terrible stage fright, suffer from panic attacks and extreme fear of public speaking?
. Do you need some help "conquering your nerves before public speaking /before a public appearance?"
. Want to learn the tips and techniques I learned from one of the best public speaking schools there is, that continue to assist hundreds of speakers, presenters and people in the public eye -to get better at public speaking and to become great speakers?
. Are you interested in learning about my very own secrets that I developed to beat the nerves - and that continue to work wonders for me? "The story of a shy girl"
I was a shy girl (or considered to be one) my entire life. I have been discriminated on because of that and some people even thought they could bully me because I was shy and reserved. But there was a lot of assertiveness and mental strength within that soft exterior and I would never have let anyone take advantage of me or dismiss me as being anything less than a full human being with immense potential for growth, like everyone else. Hi, my name is Sofia and I am a student of life and a student of human behaviour. Over the years, I’ve come to realize how motivated, confident I am and how, despite my shyness, I have always marveled at a good challenge and responded to such with enthusiasm, whether they threw me out of my ‘comfort zone’(I'll tell you the truth about this zone in the ebook) or not. I managed my introverted, shy exterior by learning about myself and by studying other people. From my childhood/school experiences, and from taking part in a lot of public speaking activities (which I mostly won! ), I discovered how much I loved public speaking and would later get a certificate in public speaking. Unlike me, a lot other shy kids may not find ways to deal with and manage their shyness so that it does not come in the way of their progress in life. This is why I sat down to write a book that not only shares wisdom (knowledge + experience) about shyness and ways to manage it, but also include practical tips on public speaking that everyone, from a four year old to a 100 year old, would find useful. I love kids and I wrote the ebook with them in mind – they have so much potential and it is sad that their potential can sometimes be destroyed by such pedestrian things as being afraid of speaking up! Exclusive public speaking tips! :–) Boost confidence, manage shyness and fear of public speaking on the one hand and learn how to be a great speaker on the other! DOWNLOAD IMMEDIATELY AFTER PAYMENT! Selling now for a low, low price of only $14.95. TESTIMONIALS “Say It! With Confidence!” by Sofia Matloga tackles public speaking from a slightly different angle in that she helps readers work with your shyness or lack of confidence rather than simply trying to overcome it. She provides tips and techniques on how to appreciate this aspect of yourself and how to be comfortable speaking in public whether that’s giving a speech or greeting a stranger on the street. Sofia did a great job, I'm impressed. There's a lot of public speaking books out there and she’s managed to put her own unique spin on it. Awesome job." If you are like many people worldwide – even seasoned speakers – you suffer/have suffered some level of fear of public speaking, stage fright, shyness, fear of failure, fear of embarrassment or rejection. Beginning public speakers often find themselves wondering where to get tips, encouragement, and coping strategies for public speaking. They need to know what to do and what not to do – at the same time they need to boost their confidence levels and manage their stage fright. And yes, there are more and more entrants into public speaking – and this career has become very lucrative, especially motivational speaking and comedy. Speaking of motivation, this ebook will also motivate you to get out and start that business you've been so timid and afraid to start! Whether you are a public speaker, aspire to become a good one or parent someone who wants/needs to be a good one, you’ll definitely love the practical and insightful tips that this book provides. Parents, you will find yourselves with more than a good reason to lay your hands on this book. You and your child will love the sections at the back on how you can help your child become more confident, compete healthier and how you can motivate them without hurting their fragile little self-esteem. Your child's grades at school depend largely on his/her self confidence. When you are done reading this book, you will realize that everyone, even seasoned speakers, has moments of fear and that you can work with your limitations since they are there to help protect you, not to limit you. You will be motivated to not let fear, embarrassment, shyness and lack of confidence stop you from expressing yourself…and most importantly, from going after your dreams. Those bullies have got no hold over your life anymore! As I mention, all these bullies will bow to passion. Get yourself a copy and start breathing a fresh air of freedom. This will make a wonderful gift for a shy, fearful would-be public speaker or anyone- child or adult - whose lack of experience, lack of confidence and shy nature threatens to cloud his/her true potential. "This ebook has a “been there done that and here’s what you have to know, you don’t have to reinvent the wheel” flair. What makes it even more attractive for beginners is that, it draws from ordinary experiences – not necessarily flamboyant ones. Now this, I can identify with since I’ve had little experience of speaking in public. I will certainly apply these tips in my interviews. A very powerful reference book for kids and adults alike – something for everyone." BUY NOW! NO RISK, NO OBLIGATIONS! After paying the $14.95 for the book using your credit card, via the secure Clickbank system, you will be given a unique receipt number and then directed to a page where you will get a link to your PDF ebook. 5 minutes, and you have your “guru in the ear” public speaking ebook – though delivery may be longer depending on the type & quality of your pc, as well as the speed of your internet connection. If you do not have PDF, you will be given a link to download it - alternatively, visit www.acrobat.com to download now. Important Note from the Webmaster: I trust that you will enjoy reading this ebook as much as I did writing it. I have no doubt that it will heal, guide, inspire and motivate you to become a better, even excellent communicator and speaker.In the unlikely event, however, that you find this wonderful book not worth your while, Clickbank will refund you of the purchase price, on my behalf. If the book helped you and you would like to let us know, please do so - you will find our contact details in the ebook. Best of luck!